Can I Freeze Potato Salad? Can I freeze the left over potato salad? 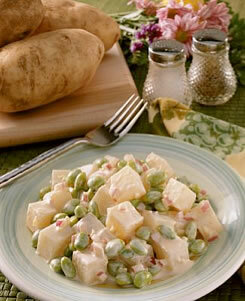 You can freeze just about anything, the question should be “can you freeze potato salad successfully”? I remember years ago getting a frozen pizza from the Pizza Uno chain and was very disappointed when I cooked it. The wonderful strips of onions and green peppers had turned to mush. Mayonnaise doesn’t freeze well, same with celery and eggs. The potatoes will get an off color from the mayo, which separates. So, I would not suggest it. Also, from a food safety standpoint, once the dairy is mixed with the potato it is best to consume right then or at the latest, the next day. If you know you have cooked too many potatoes for the salad, you might try freezing just the boiled potato chunks and then using them to make a salad, or for home fries later on. To get rid of any excess moisture I place the potatoes in a salad spinner before putting into plastic food bags for storage in the freezer. Do not place the potatoes in foil and freeze, use the plastic bags instead. Foil can discolor the potatoes.